Santa Maria Novella’s Marescialla fragrance was named after Léonora Dori Concini, La Maréchale1 d'Ancre, who was beheaded and burned at the stake in Paris on July 8, 1617, after being convicted of sorcery. Or so I think. Santa Maria Novella’s description of Marescialla reads: “This unusual perfume was created by a French noblewoman, the Countess D'Aumont, wife of a Marshal of France, who used it to scent her gloves. It is said that because of her interest in alchemy, she was charged with witchcraft and burned at the stake.” After some research, I could find no mention of a perfumer-witch-alchemist named Countess/Maréchale d’Aumont. To confuse matters further, Crown Perfumery once made a perfume named in honor of La Maréchale d’Aumont (a non-witch) — Maréchale 90 — based on a recipe from the 1600s. I expanded my search for the elusive Maréchale (Marescialla in Italian) and after reading an opera libretto, a play, some Voltaire, a brief history of the Marshals of France and records of witchcraft trials in France and Italy, I believe she is none other than the Italian noblewoman and wife of Le Maréchal d’Ancre: Léonora Dori Concini, La Maréchale d'Ancre. We’re back where we started! La Maréchale d’Ancre, also known by the name Galigaï, was the wife of the powerful Maréchal d’Ancre, Concino Concini, a minister in the court of Louis XIII. 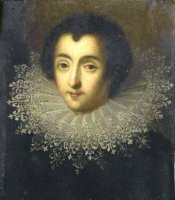 Louis had “mamma issues” and hated the fact that Concini and Galigaï were in cahoots with the Queen Mother, Marie de Medici (Galigaï’s foster sister). While serving as regent to the young king, Marie promoted Concini to powerful positions in government, and Concini alienated Parisians of all classes by using his power to gain wealth and spy on anyone he deemed a threat to his high status at court. In 1617, four years after Concini became a Marshal of France, Louis XIII had him killed and his property seized, and the Queen Mother was exiled from court. After losing her husband, La Maréchale d’Ancre was abandoned by Marie de Medici too, and without any protector, she was charged with the crime of witchcraft — accused of using otherworldly powers to influence Marie de Medici. In court, it was alleged that La Maréchale visited known witches (who were apparently allowed to go about their witching business freely! ), consulted seers and astrologers, and sacrificed albino roosters in cathedrals. Jealousy and revenge fueled the criminal proceedings against La Maréchale and after being found “Guilty!” she was asked by the judge what spell she had used to control Marie de Medici. Calmly, La Maréchale said a strong heart would always control a weak mind…no spells were necessary.2 Touché! Marescialla Eau de Cologne is bewitching and, to me, comforting because it smells like my grandmother’s apple pie — without the apples. My grandmother seasoned her apple pies with lots of lemon juice and zest, nutmeg and a generous sprinkling of mace; her apple pies were spicy-hot. Marescialla smells of ‘fiery’ mace and lemons and it seems to be a love-it-or-hate it perfume (some of my friends say it smells like furniture polish). Since La Maréchale (supposedly) used the fragrance to scent her leather gloves, I layered Marescialla with Knize Ten and the result was bracing and good. Marescialla is a ‘simple’ perfume, but the battle for supremacy between its pungent mace and tenacious lemony notes makes the fragrance’s development interesting. Marescialla’s citrus note — waxy, intense, and in a strange way “antique” — lasts and lasts. The life and death of La Maréchale d’Ancre inspired writers, musicians, and, perhaps, Santa Maria Novella. I have no idea if La Maréchale d’Ancre (or any maréchale) actually created the Marescialla fragrance, but it’s interesting that in some books of witches’ spells, Marescialla’s main ingredient, mace, is recommended as an agent that increases psychic abilities and mental prowess. A coincidence? Marescialla is $110 for 100 ml; for buying information, see the listing for Santa Maria Novella under Perfume Houses (request a spray nozzle with your order if you do not like “pour” bottles). 1. The title ‘Maréchale’ denotes the wife of a Marshal of France (Maréchal de France). 2. The only attribution for this quote is from Voltaire, whose own source for the witty line was not disclosed. Note: image is Eléonore Galigaï, maréchale d'Ancre, anonymous, via wikipedia. Wow – nice bit of research! Love the bit about the albino roosters – gadzooks. Your description of the waxy citrus does make it sound a bit Eau de Pledge, but, as always, I want to try it because I love your review! I bet it'd be nice mixed with the Vanilla and/or Patchouli? Smooth spices and woods sounds like a nice mix. SFLizbeth: yes, I think it would mix well with either of those (especially vanilla). The History buff in me loves the older fragrance houses and the stories that inspire the scents. Lafco has a store in NYC, I'd love to roam around and sniff everything! I spent a couple of summers in Florence and wore the heck out of Sicily. I wish I had my bottle of Peau d'Espagne that got lost in the last move. Fun read Kevin- will seek out a sniff. Fascinating stuff! What a great story. My mother – who inspired the nascent perfume lover in me by wearing the hell out of Chloe, Aromatics Elixir and Cinnabar in when I was a kid – bought me a scent one year for Christimas from an Italian niche perfume house (not SMN, I can't remember which) which is based on the notes of Caterina de Medici's signature scent, mostly lily of the valley. It smells unfortunately old lady-ish. SMN's frags are distinclty 'antique.' Melograno smells like the inside of a tiny, musty Italian church, but I love it. I'm curious to smell this one. SFL: me too…it's time for a NY trip. monkeytoe: haven't smelled Peau d'Espagne in ages, but remember it fondly. helenviolette: good luck finding it…it's one of the SMN scents you rarely find on a perfume shop's shelf (but you can order samples). Jessica: I bet your mother bought you Caterina de Medici by i Profumi di Firenze…and I'm a fan of Melograno too, been using the soap forever. I have many pleasant memories of NYC during the Holidays, going in to the city and shopping with Mom, seeing shows & museums with Dad. Time for a trip for sure! How fascinating! Thanks for doing researching all that. Fiery lemons is how I am reading this, which sounds intriguing. As an aside, not long ago, a particularly nice person sent me a sample of Crown Perfumery's Marachale, which is very antiquey and green, and which I like very much – neat to know who it was named for. Wow, Kevin — you really flexed your research chops on this one! Nice review. Now this is MY kind of “celebrity fragrance” — despite the grisly details. At least they didn't use any burnt accords in the composition. This sounds like an interesting one as long as I don't get the dreaded furniture polish overtones. I love that label as well. I've never tried any SMN scents. Would that be called “Acqua di Pleggio”? Joe: or to make it more warlike: Pleggio di Marescialla! Exist: as an aside, Crown's marechale was an early perfumista: had perfume AND wig powder named after her! Joe: ah…I love the scent of varnish, wax, lemon together…DO give some SMN scents a try…they have a large range. Kevin, I really enjoyed reading this. I love reviews that go beyond the perfume itself, exploring the history (in this case) or other tangential connections one might make to the scent. Sounds like it wasn't easy to research La Maréchale d’Ancre's story, but it was worth the effort. Thanks for your fascinating post! SuzanneK: you're welcome…one CAN improve one's IQ thru perfume! Pearlymom: I think The Perfumed Court (they have a website) offers samples of Marescialla for $3-$4. I love the toiletries from SMN too… but sooooo expensive. I may have audibly squealed when I found the the Perfumed Court website . . thanx to you. And here at my desk while I'm supposed to be working! Can't wait to try Marescialla. May snap up a few drops of MKK while I'm at it . . loved your review of that one. My BFF, who posts as Kyriaki, turned me on to your reviews and recommends that I sniff and think about MKK too. She says MKK has an undeniable sexuality but is hard to pin down. Sounds strange, and I love strange. I am new to learning/understanding scent, and don't know all the lingo yet. Glad to find enlightened enthusiasm in these posts. Pearlymom: I hope I've not created a monster with the Perfumed Court site…it's DANGEROUS to peruse it! I keep praying MKK will join the export line for a limited time one year…but so far, no.